Michael Dougherty, charter member, was the 1st Secretary of Division 1. He was born on May 10, 1844 in Falcarragh, County Donegal, Ireland. He was the youngest of seven children. In 1859, at the age of 15, he came to the United States. 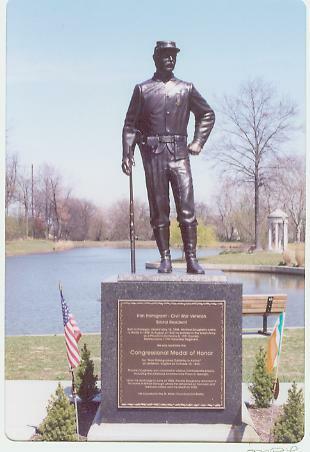 At the age of 17, he enlisted in the Union Army and joined the Second Irish Dragons. The Dragons were a calvary battalion composed entirely of Irishmen. According to Dougherty's prison diary, on February 26, 1863, 13th PA Cavalry (where the battalion was assigned) was encamped at Winchester VA. Dougherty's regiment captured a band of rebel raiders (8 to 10) and drove the remainder into the camp of the 11th VA rebel regiment at Woodstock. On return to their camp at Fishers Hill, the regiment was met by a large force. Approximately 108 of Dougherty's regiment were either killed, wounded or captured. As they were forced to retreat, Dougherty's horse was shot out from under him at Strawsburg. Along with 50 other men, Dougherty was taken to Libby Prison in Richmond. He was confined there until May 26. He was then exchanged and rejoined his regiment at Winchester. October 12, 1863, Dougherty was captured at 5pm along with 127 of his regiment. October 18, 1863, he arrived at Libby Prison in Richmond, VA.
February 9, 1864, he arrived at Raleigh N.C.
Dougherty's courage in warfare and humanitarian efforts were said to have saved the lives of 2,500 men. Dougherty was captured and held in many confederate camps, including the notorious Andersonville Prison Camp in Georgia. The union soldiers were subjected to inhumane treatment that contributed to the deaths of thousands of soldiers. Sadly, Dougherty was the sole survivor of 127 of his regiment that were captured. 122 of his men died in the Andersonville Prison. After his release from the prison camp, on April 23, 1865, Dougherty was being shipped home on the overcrowded transport ship, Sultanna. The ship was heading to St Louis, Missouri. On board the ship, there were approximately 2200 people (mostly prisoners) coming from Andersonville. On April 27, the ship's boiler burst and the fire spread quickly. Fire increased in its intensity setting the ship on fire and causing it to sink. Michael was credited with rescuing many of his fellow passengers. On June 27, 1865, Dougherty, now 21, was discharged at Spring Mill, PA. He arrived in Bristol that afternoon. Michael spent in total, 23 months and 17 days in southern prisons. On his arrival in Bristol, he was immediately placed under the care of Dr. E.J. Groom. In less than one year, he was back in fair condition. When Dougherty left for the army, he weighed 150 lbs. When he returned, he weighed less than 100 lbs. Later, he married the former Rose Magee at St. Mark's Church. He fathered 12 children, three died when they were infants. He worked at the U.S. Mint in Philadelphia and never missed a Memorial Day Parade. He served as Bristol Council Member from 1880-1882. He was awarded the Congressional Medal of Honor on January 23, 1897. Michael stayed active until his death in 1930. While incarcerated, Dougherty wrote about life in Confederate prison camps where union soldiers suffered from malnourishment, starvation and disease. His book, The Prison Diary of Michael Dougherty documented the abuses and hardships that the union soldiers experienced in the camps. A.O.H. Division 1 officially changed its name to the Michael Dougherty Division in 1988 to honor their most famous charter member. On Memorial Day 1989, more than 300 people attended a commemorative Mass and a ceremony with men representing every war from 1861 to the present in full uniform. A plaque was placed on Dougherty's grave in the small cemetary behind St. Mark's Church.